III – How to check Permission Rights? V – Help! My User Rights Doestn Work? 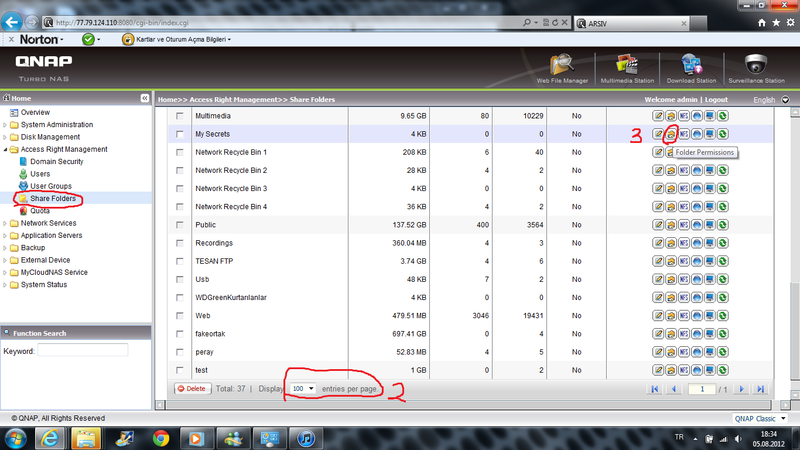 2 – Give your folder name, choose which HDD or RAID you want to create this folder and press next. 4 – Now, everyone can create, delete or change any file in this folder. Not go to Share folders, change “Display 100 enteries per page” to see all folders and click “Folder Permissions” icon (a hand holds yellow folder). 3 – at left down of the page, Go to “Add” . I dont want anyone see my folders do press “Dent Access” to give deny permission everyone. 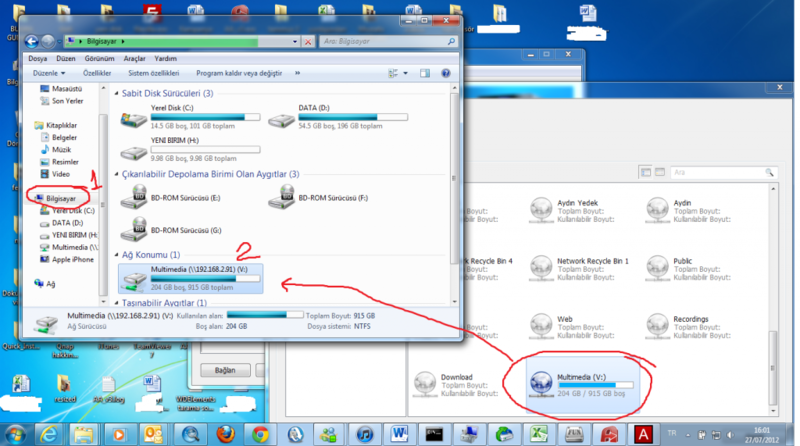 4 – Then Press person you want to use this folder (Mine is Buğra user) and finally press “Add” to complete. Dont forget to click “Apply” to finish process. 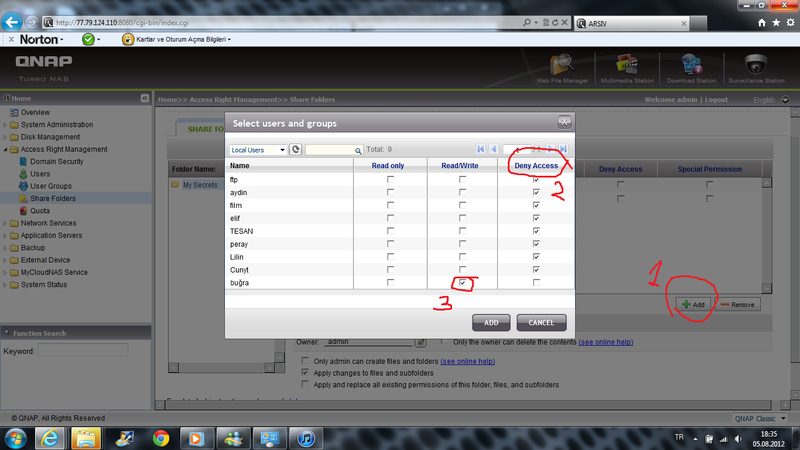 5 – Also My User is in “Everyone” group and that means buğra user also has “Deny Access” Because of this option. So Click once to Everyone group, and remove button. 6 – Now my user have rights to access this folder. Now its time to test if we give permissions right or not and best way to understant is using Qnap’s Web file Manager feature. 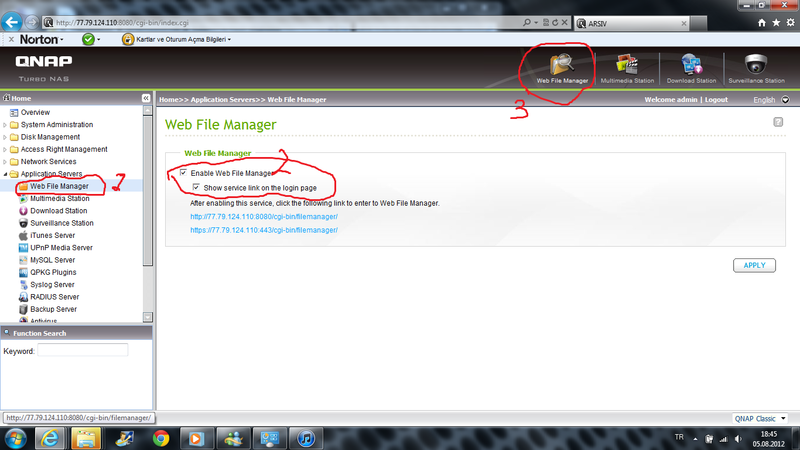 Now go to Application Servers -> Web file Manager and Enable web file Manager and press “Apply” . Then Press Web File Manager icon up right of the screen. 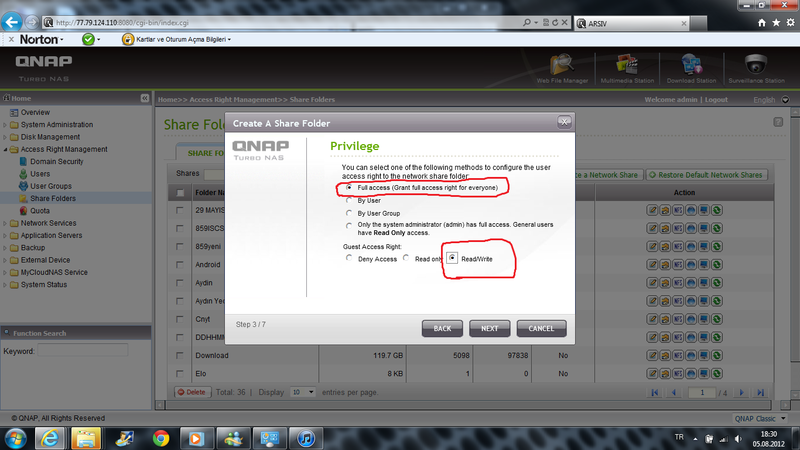 2 – Qnap will automaticly login as admin, and as you remember, I give “Deny Access” even to admin, and I cant see My Secrets folder. 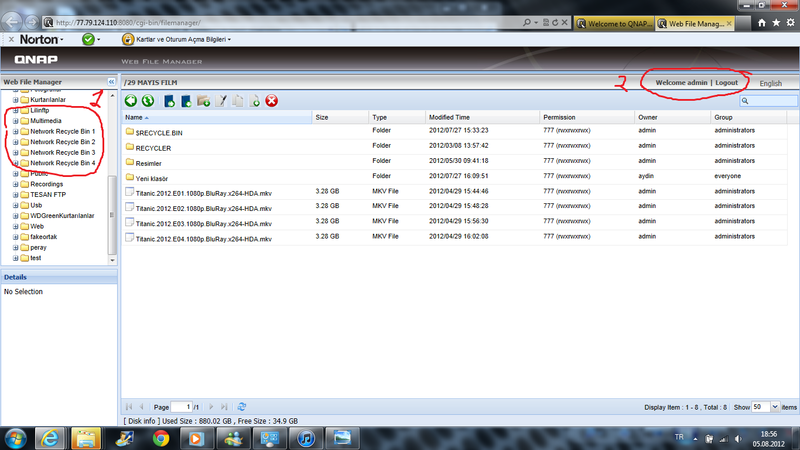 3 – Now Press “Logout” Up right orf the seccren and login as buğra user..
4 – I can see my secret File. 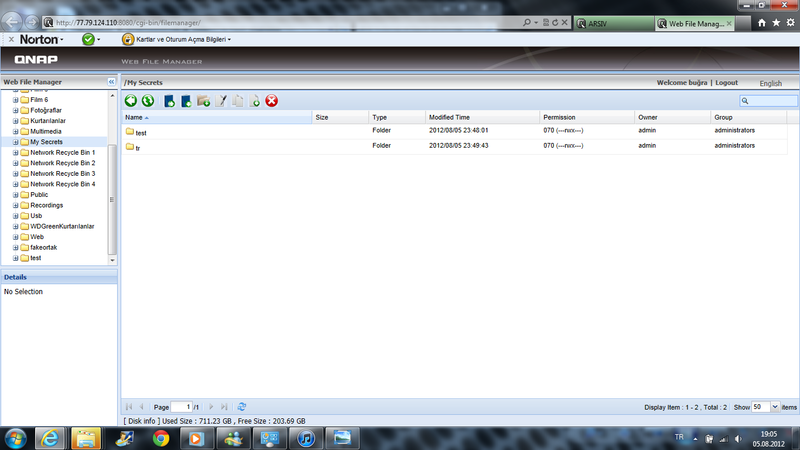 Also Admin or any user & Group except me couldnt see my files anymore. 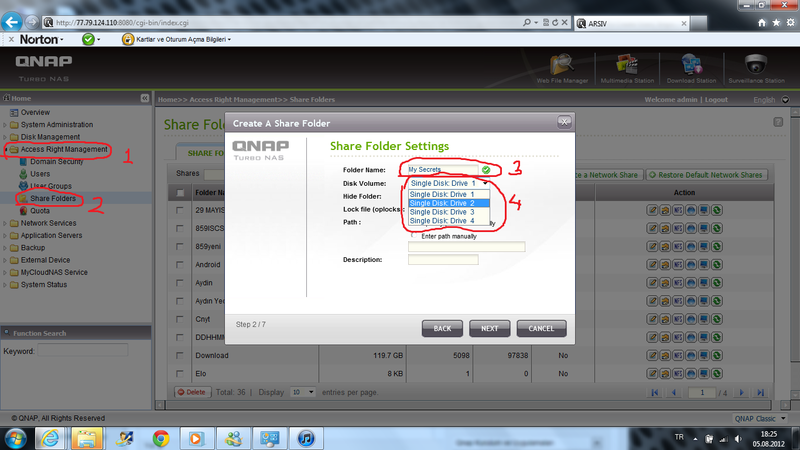 IV – Shortcut to your folders..
4 – Now Qnap creates a shortcut for your folder, and you can use this folder as you wish. Also if you go Connect ->File manager, you can view all of your share folders at the same time. If you got Any trouble, please contact with Qnap support team. V – Help! I cant Access My files, and My User Rights Doestn Work? Windows give “You Dont Have permission to Access” error? 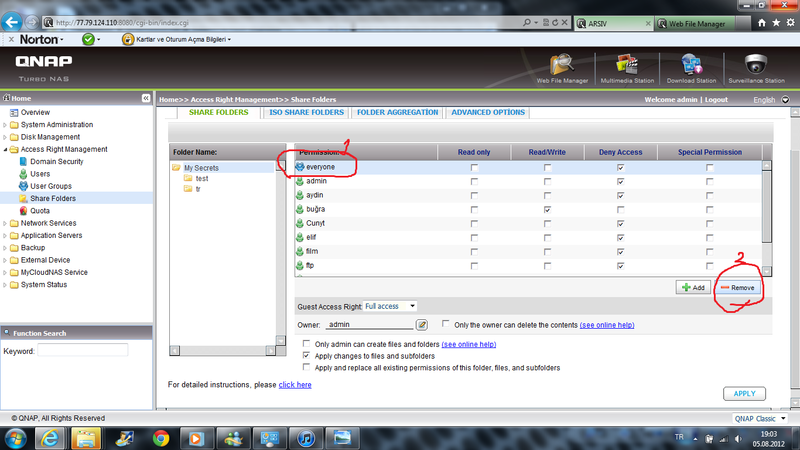 If your join your Qnap to AD, you must type “Domain+User” or “Domain\user” to username. If problem continue, Please go to share folders and check if you give right permissions. Dont forget, if you give Read-only permission to Root folder, you cant give Read-Write Permission to its Subfolder. 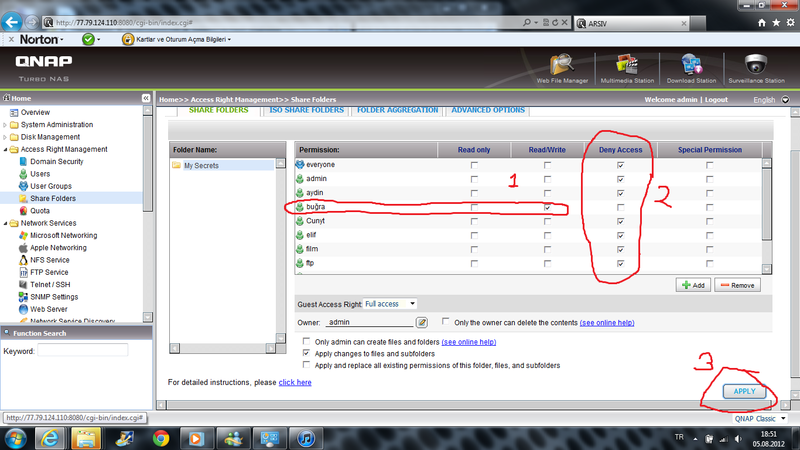 Also check if you dont give “Deny Access” or “Read Only” to that user Group. Please go to share folders and check if you give right permissions. Dont forget, if you give Read-only permission to Root folder, you cant give Read-Write Permission to its Subfolder. If problem accures, please check “Advance folder permissions” documents. d - Why cannot I log in with a user? I already gave the user RW or RO access right. “UserC” is a member of “UserGroupA” and “UserGroupB”. For share folder “Qdownload” you give “UserGroupA” RW, “UserGroupB” RO, and you do not configure “UserC” (Empty), the resulting access right for “UserC” is RW.